This will hang in Cate’s room. 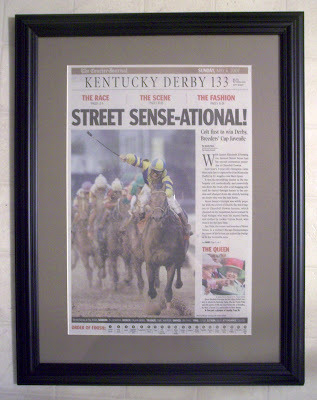 I wanted to hang a newspaper with her birth date in her room, and the timing was perfect with her arrival coming the day after the Kentucky Derby. Such a pretty newspaper for a beautiful baby who is going to be raised a Kentucky girl despite her inital Hoosier roots.